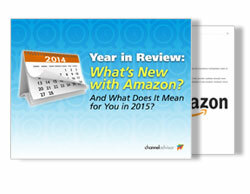 Year in Review: What's New with Amazon? If you’ve had your head in the sand this year — or really, just had your head down trying to run your business — we’ve broken down some of the major Amazon changes in 2014 you might have missed. Then, we’ll tell you what implications they have for you as a retailer and provide a quick checklist for some of the steps you should be taking to adapt to them. Download your eBook to learn what's new with Amazon! ChannelAdvisor (NYSE: ECOM) is a leading provider of cloud-based e-commerce solutions that enable retailers and manufacturers to integrate, manage and optimize their merchandise sales across hundreds of online channels including Amazon, Google, eBay, Facebook and more. Through automation, analytics and optimization, ChannelAdvisor customers can leverage a single inventory feed to more efficiently list and advertise products online, and connect with shoppers to increase sales. For more information, visit www.channeladvisor.com.